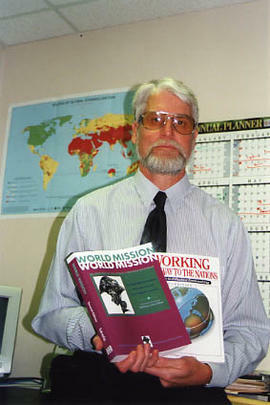 Photograph of Jonathan Lewis, Director of the ACTS Inter-Cultural Ministry (AIM) Studies at Trinity Western Seminary (TWS); he is holding two books he has written. Photograph of Ken Davis and Don Page in the recessional for convocation. Photograph of Don Page speaking from the podium at convocation.